Feature Friday is something we have that features books we get sent by authors, but can't review them. This is Feature Friday five. 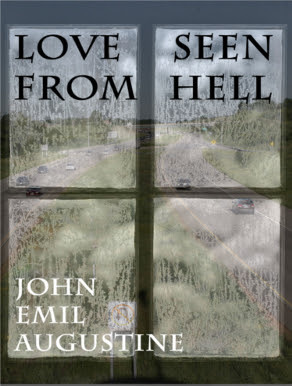 This week's Feature Friday is featuring John Emil Augustine's adult book, Love Seen From Hell which is the first book in the Love Seen series. This rare and honest first-person account looks at 21st century romance, marriage with children, and divorce from a regular guy’s perspective. The colorful and addictive narrative delves deep into spousal abuse, the hopeless place in which a father finds himself during divorce, new beginnings, and his ordeal’s significance in retrospect. John Emil Augustine’s insight throughout, the result of his own tragedy and redemption, is nothing short of eloquence itself written in a very down-to-earth, casual way. This heart-jerking, wisdom-flecked story is a must read for lovers of fiction and non-fiction alike. for the always-appreciative crowds. The piano, worn and tucked under the staircase, would get to swinging under his knowing fingers. The old 1970s Vocal Master PA system stashed behind the piano amplified the microphone which he hung around his neck with a metal coat hanger. The other musicians, usually an upright bass player, a drummer with only a snare and hi-hat, and a guitarist, crowded around Cornbread at the piano next to the staircase entrance, inches from the tables downstairs. Everything about the act was completely authentic, and he drew crowds like crazy. "When Cornbread wasn’t playing, there was a solo piano guy who played Jazz there. So I decided if we went on a night like that, it would be fun, but not too much fun – not “Cornbread” fun. And it would be quieter so we could talk. It seemed like a good compromise to me. I set it up for the next weekend. "I told Kim in an email that we could meet there and she had replied that the opposite of our meeting there would be my picking her up. This was getting a little out of my comfort zone, but I realized that she was right, so I obliged. Actually, I thought, my truck would be a pretty good turn-off just in case. I had further worked on my tail pipe, but it still had a roar to it. For that matter, the truck itself was a bit of a rust bucket. I was sure she had guys in fancy cars picking her up, so this would one-down those guys. Anyone else she was seeing at the moment would be all the more alluring.